Histrionic performance ruined this book for me! I've read The Bourne Identity many times. It's a great thriller - full of excitement, well-paced and well-constructed. It's a little old-fashioned nowadays, I guess, but I was really excited when I saw it was available from Audible and bought it straightaway. What a disappointment!!! The reader, Scott Brick, who is billed as an outstanding performer, gave an over-the-top histrionic performance which completely ruined this talking book for me! "And he LOOKED over the BOAT'S RAILING and he SAW ...". Enough of that - you get the picture. Every noun and every verb was declaimed in a tone of almost complete hysteria. I was driving the car down a country lane while I listened to the start of the book and I had to pull off the road after about 20 minutes and stop the performance. I just couldn't stand any more! The book is exceptional. The story much better than the story in the movie but I see it as a bonus (similar stories in the same vein). I thoroughly enjoyed the story and look forward to the next in the series (Supremacy) BUT I am going to opt for the abridged version narrated by Jeff Harding, even though it is 20 hours shorter. From the sample it sounds acceptable. The performance of the narrator is mostly top notch but I hate it when people do not finish their words or sentences. If a word is worth saying then say it, dont sa i.
Scott Brick improvised by far too much! Yes. The book is great; a page turner. But this audio book is a bit annoying. Why? See below. Scott's performance isn't bad, but it's more an interpretation than reading the book. Certain passages got completely altered by Scott, which makes it hard to follow when listening to the audio book and reading the book at the same time. His characterization is believable, though. The story comes to live. But as I said it's not what Robert Ludlum wrote. Very enjoyable book. The movie is not based on the book in any meaningful way. I have read this book many times, although not in recent years, and it has always been one of my favorites. It just didn't work for me in audio format - Jason Bourne's frantic and repetitive thoughts and mantras came off very strange, which is of course a failing of the author.. But the narrator did not do Marie well at all - she sounded very stilted. In short, I was disappointed. A gripping story read by an excellent narrator. 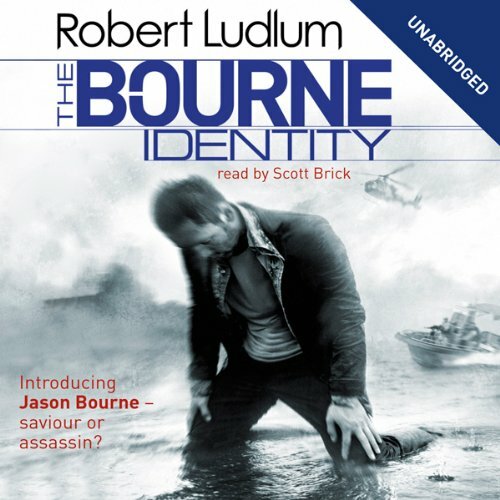 If you could sum up The Bourne Identity: Jason Bourne Series, Book 1 in three words, what would they be? Intriguing, Extreme and a Masterpiece. Jason Bourne. The story presents him as broken and yet extremely capable. One can't help wanting him to succeed in his journey to discover who he is. The Bourne Identity: The assassin who was not! Carlos should have been given a more active role in the story. Bourne's episodes of "blinding" recollections that appeared ti incapacitate in quite frequently seemed rather extreme at times. I have read this 3 times. Always amazed! Love it!!! A great book which I've now listened to three times. Buy this book. My interest in the BOURNE stories was created by viewing the movies. I have only hear this one book so far. I could not gain the interest in it that I have had in other Audible books. I will try again with another BOURNE story and try again. Obtain a new reader. Don't watch the movie first. The story is involved, this is the way it is meant to be but needs a person with the ability of the author to make the story real in your mind. I didn't find this with this reader. The movie spoilt this plus the reader. I will leave it for a while till the movies forgotten then try another one.